Only in New England could we go from 52 degrees and pouring rain to 75 degrees and beautifully sunny. Yesterday certainly was that. It almost felt like we had jumped ahead to June and the 14 inches of rain we received over the last month was long ago. 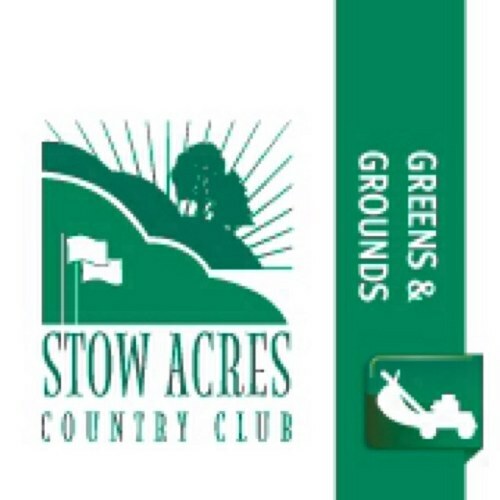 Even though we had as much rain as we did earlier this week, Stow Acres drains well enough that we were able begin mowing grass on Thursday, April 1. It’s official, the grass is alive and growing. These warm temperatures, especially at night, has allowed microbial activity in the soil to begin making food for the plant. We are off to a great start. We have mowed everything we can without driving through rain-made ponds. Greens, tees, fairways, and approaches have been cut, green side bunkers have been raked, and bunkers will continue to be pumped as next week progresses. The rain really hasn’t left too much damage except for excessive water on the North course. Holes 4, 5, and 6 are the only holes that are really effected with a giant pond also on 17 approach and 2 tee. If you have played the North course, then you can agree that it is definitely playable. 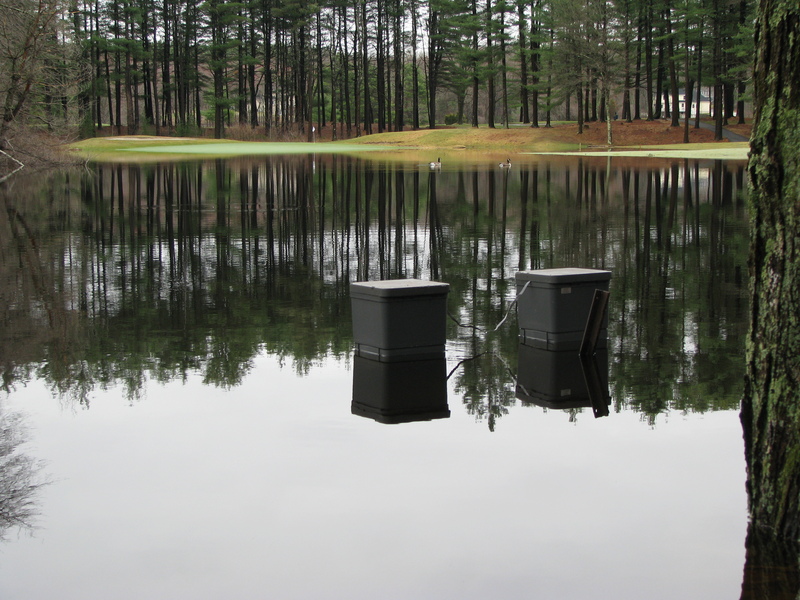 The South course is allowed carts and it is considerably less wet. Holes to look out for on the South continue to be 2, 4, 14, 16, and 18. Hole 4 South has a temporary tee due to wet fairway conditions. Holes 4 and 6 North have temporary greens due to wet fairway and approach conditions and Hole 2 has a temporary tee because the entire tee complex is surrounded by water. Greens have been cut once so far; the South was cut on Thursday and the North was cut on Friday. They were mowed at a height of 0.140 inches and are rolling approximately an 8.5 on the stimpmeter. We will continue to lower the height over the next few weeks, and the speed will continue to increase. We have to be careful starting out early in the season so we do not scalp or harm the turf. Our goal in the next few weeks will be to mow greens at a height of 0.125 inches and have them rolling approximately a 9.5 on the stimpmeter. Here is a explanation of the stimpmeter (http://en.wikipedia.org/wiki/Stimpmeter). Fairways and tees have also been cut once at a height of 0.550 inches. This height will also be lowered over the next few weeks so we do not stress the turf too soon. 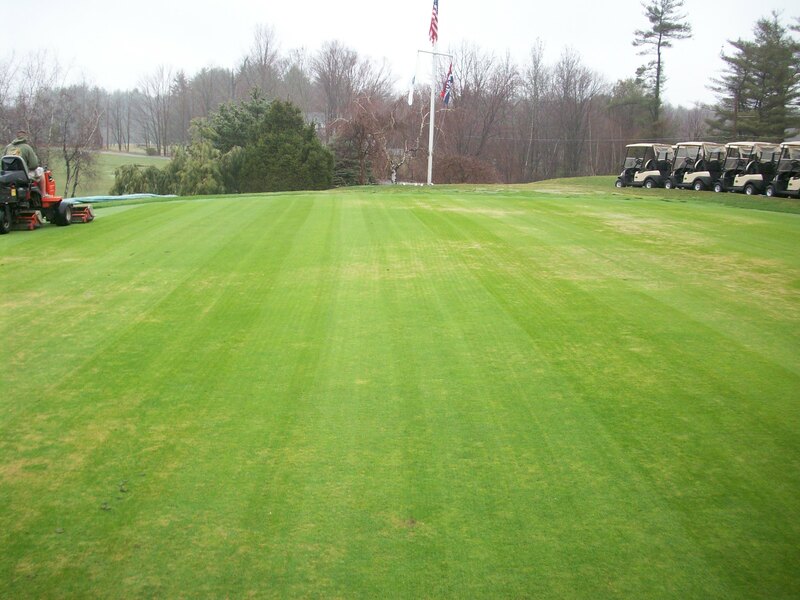 March 10, 2010: It is evident that there is definitely some winter kill and desiccation on 3 greens. Greens LPG, UPG, and 3 South were effected. 16 South suffered from some anaerobic conditions on the back left corner of the green. Drainage channels will be punched with a 5/8” diameter 12” long tine and the holes will be filled to the top with a mixture of ecolite and sand. Moisture will be monitored. The other three greens will be left for now as soil temperatures are still too low to really make a difference. March 22, 2010: Greens LPG, UPG, and 3 South were shallow needle tined today at 2” spacing. The greens were then top-dressed with a light topdressing sand in one direction. A drop spreader was used to drop approximately 4 lbs/M of G1 bentgrass seed into the tine holes. Following, 2 bags of Renovate was applied and the greens were covered with permeable turf blankets. Covers will remain on until air temperatures increase. March 31, 2010: Weather conditions continue to be wet. A light mist this morning allowed us to remove the covers from the damaged greens. Once the covers were removed, we mowed the greens at a height of .140. We pro-seeded at a rate of 2 lbs/M with G1 bentgrass, 1 bag of Renovate, 1 bag of Replenish 5-4-5, and 1 bag of Excellerator were applied. The greens will be covered this afternoon to keep soil temperatures up overnight. We take all damaged turf very seriously and will be doing whatever it takes to bring these areas to 100%. 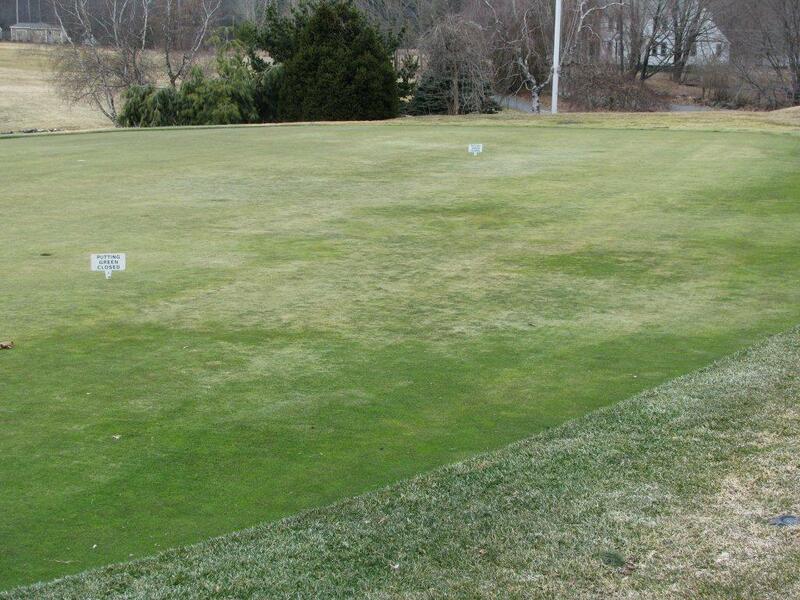 I appreciate your cooperation as these practice greens remain closed. As always, thanks for your support! Enjoy the beautiful weather and I will see you on the course! I would like to leave you with a picture of 4 North taken on Tuesday when we received 3 inches of rain.